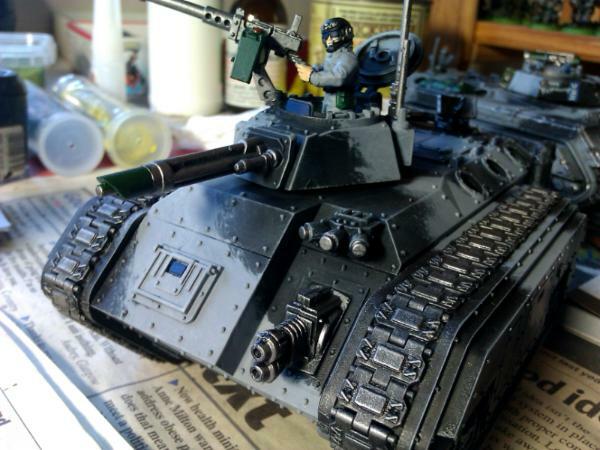 I've actually done some more work on this army again! Here we can see my standard medic build, check the RTB01 knife. 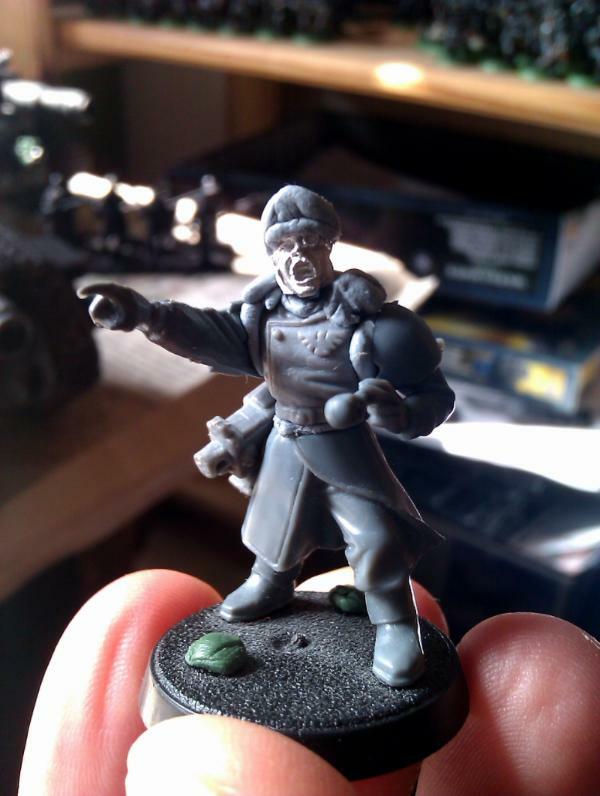 Junior officer No.3, he's got a RTB01 powerfist like the other (2nd Platoon) officer. 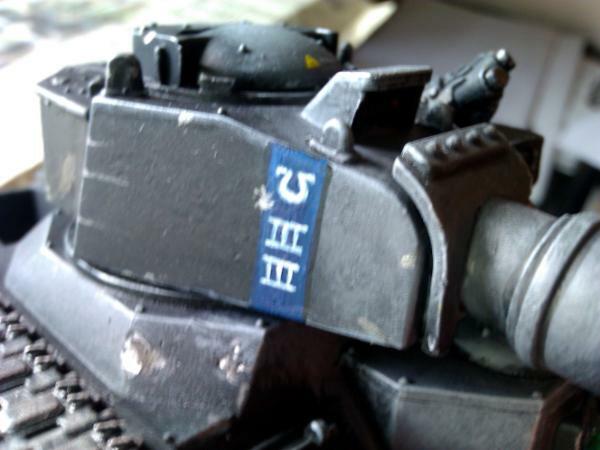 The torso is a Valkyrie one to keep up the 'all officers in breatplates' theme and theres GS all over the place to make all the bits fit nicely. 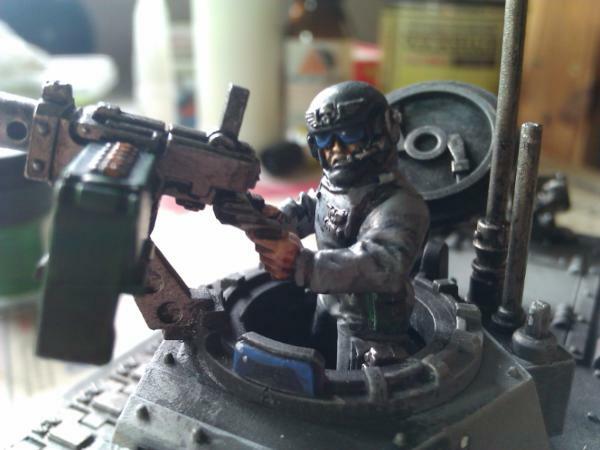 Flamer and Melta, pretty standard, added goggles onto Melta gunner to differentiate this one from the same model in 2nd Platoon HQ (which this unit is equipped the same as). Yeah, that SM ML is awesome! The guard HK looks a little goofy. 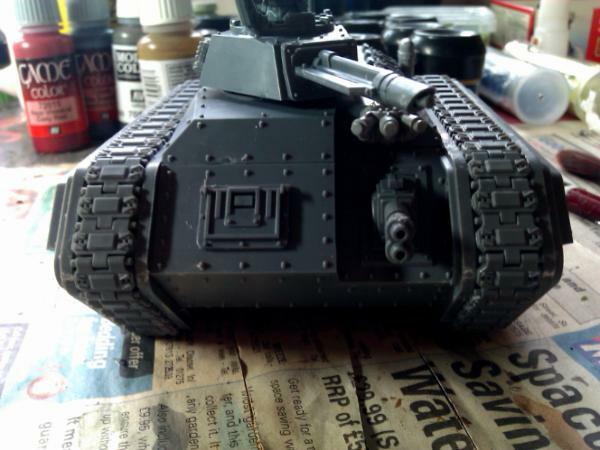 Here's the unit 60% painted, basecoat and black ink wash, sepia for the flesh. 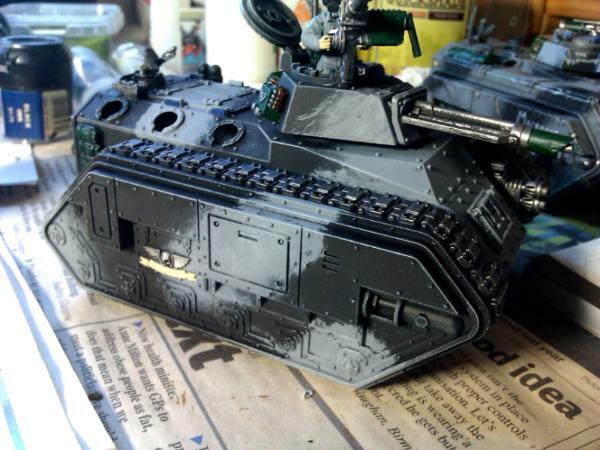 Getting there I should be able to finish them today, I also want to work on my new Chimera, I'll upload some pics of it built in a bit. 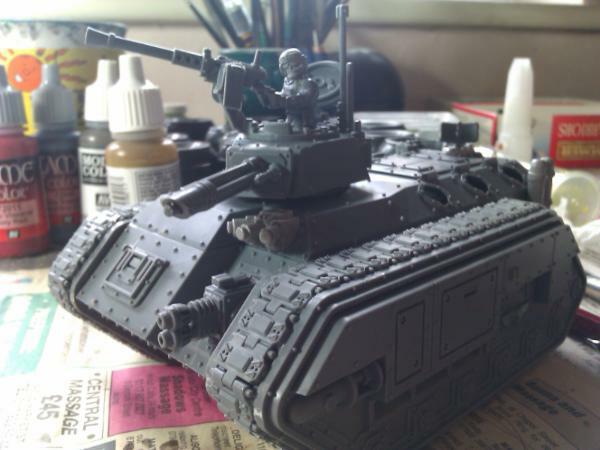 Here is my new aquisition, my HQ's Chimera, it will be called 'Argo'. It's the new version of the kit. 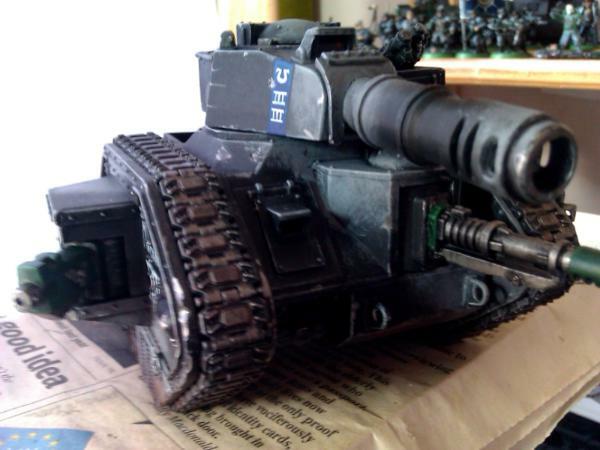 Slimmer than the old version for easier parking...old style smoke launcher as they are cooler..
As it's the GT version, there's all the Stubber ammo you could eat..
Satellite uplink for all the major sporting events...the mount for this is a FoW turret ring.. 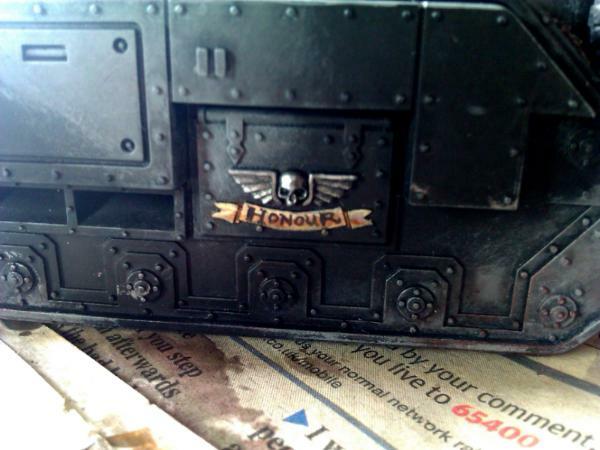 I'll add some painted pics soon too, let me know what you think..
Duty and Honour, the regiments motto. Tyrannic war battle honour won by the regiment. Well I'm off to play a game, let me know what you think. 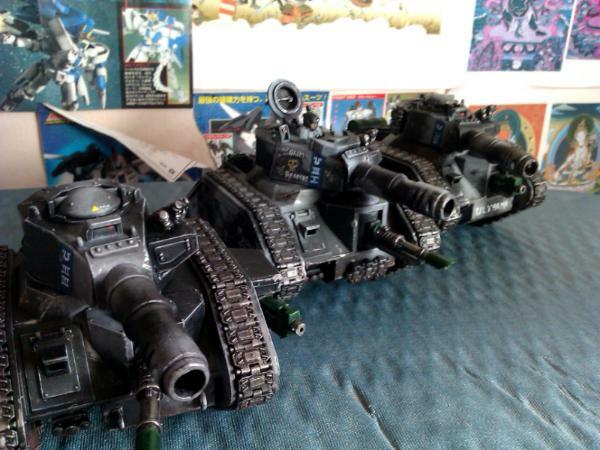 Subject: Re:Randy's Macragge Planetary Defence Force (Imperial Guard) Completed Awesome HQ Chimera!!11!!1! Will do a BatRep soon maybe with Alex (my opponent) will link to it from here.. Here's a link to the full report which is finally finished Clicky . It was a really fun game, and it was great to use practically all my stuff at the same time, see what you think. 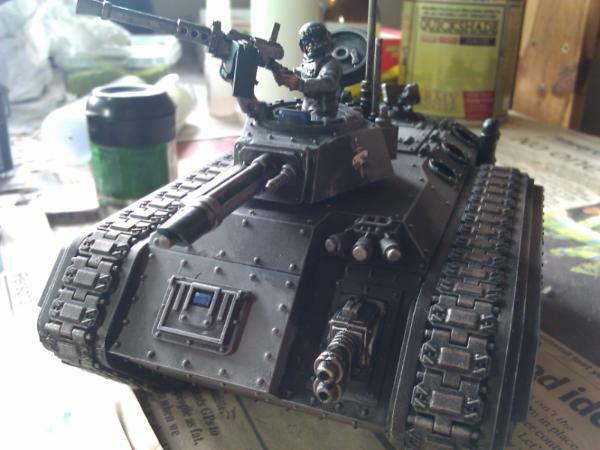 This one actually has sponsons and made his debut in the above BattRep. 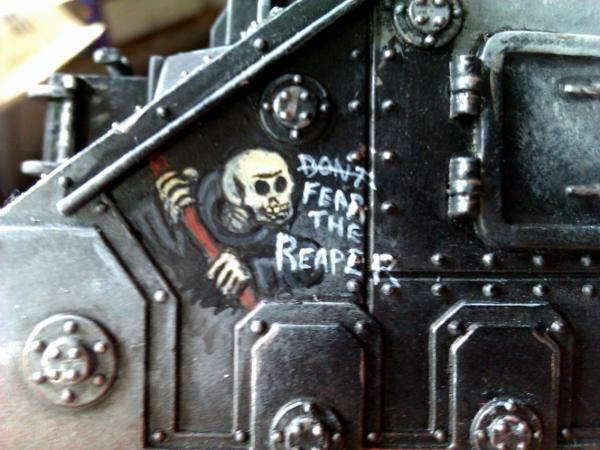 As a member of the 'Grim Reapers' (my Russ squadron) he has a mural to link him in. 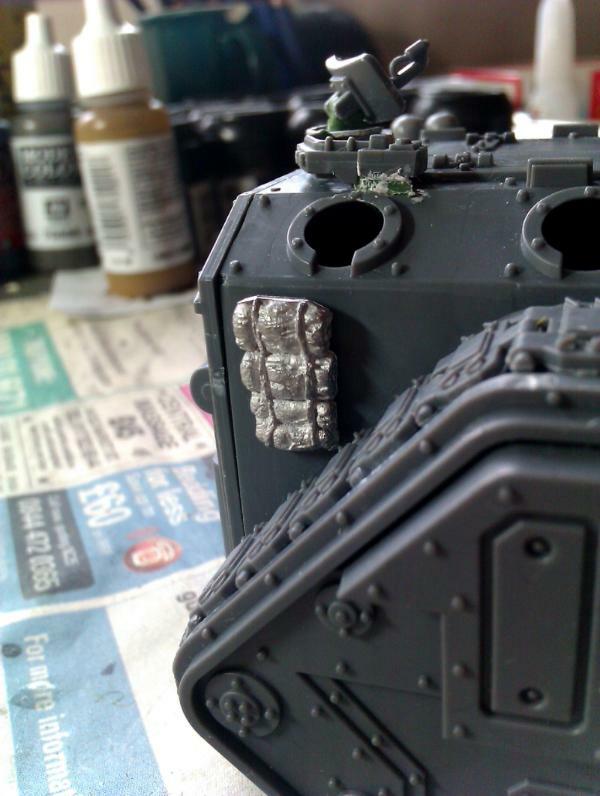 Some Imperial Guard rock fans humour..
Unit name and insignia, all in keeping with it's 2 brothers, I'll post a family picture or 2 later. 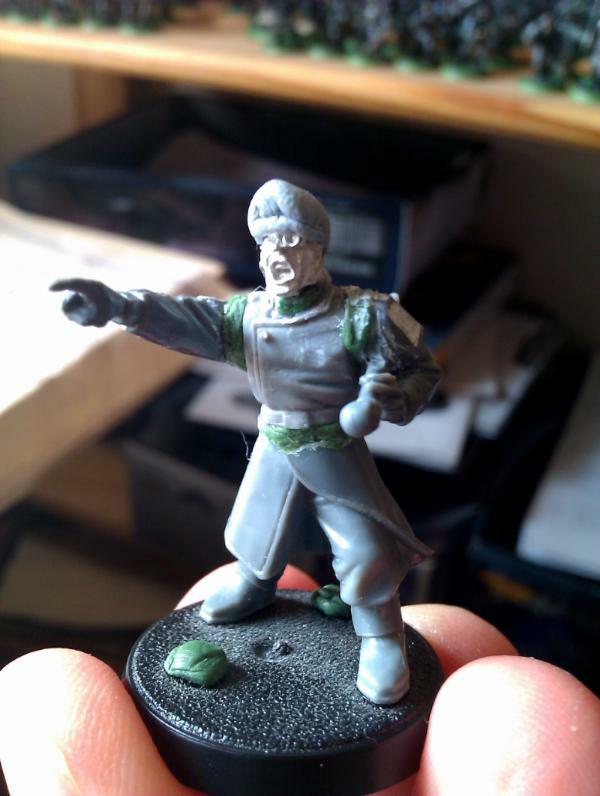 I'm working on a converted Commissar too (it's slightly visible in pic 1 above), I've got some WiP pics for him so I'll stick them up soon. Whatta return! Looking good, Randy. A family photo would be great! 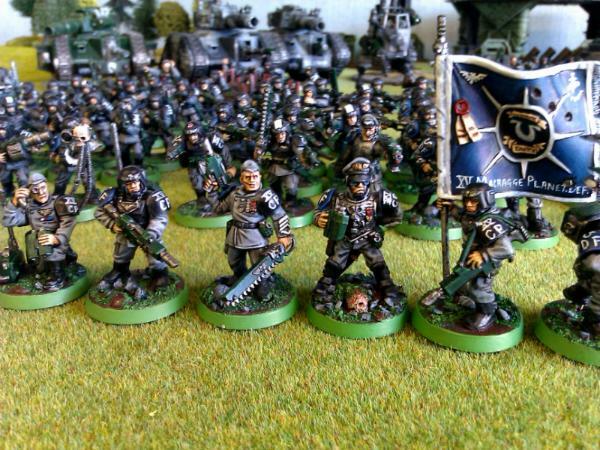 Lovely armies, lovely tables, lovely batreps. Just fantastic! 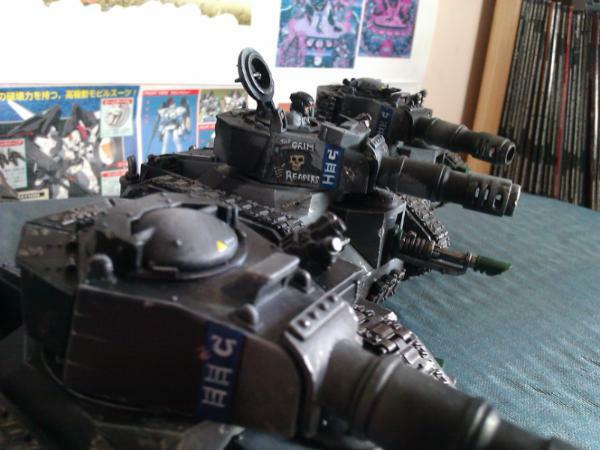 They are patrolling the great plateau of Ironingboardus after recent reports of strange xenos robots operating in the area. 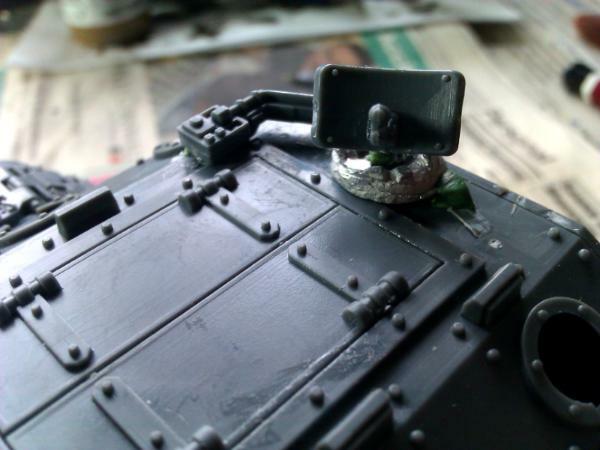 Line astern, I'll try to do some more pics at 'Cut and Thrust' next time I'm there for a game as I'll be able to get better lit shots on nicely painted terrain.. 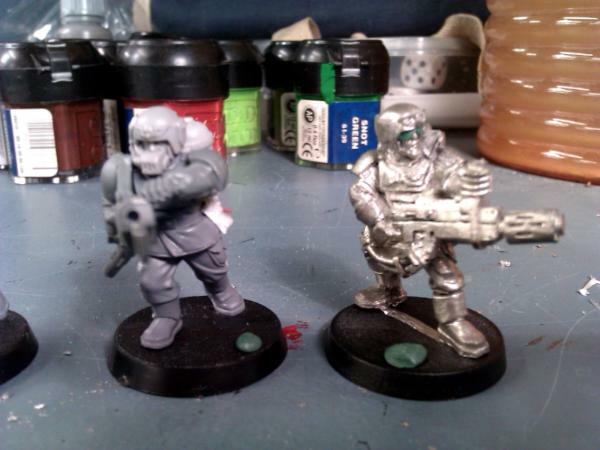 I'm giving my WHA HYW army a break ( link for the interested, I've only got one 28mm guy doen so far the rest is all 22mm ish) so will hopefully get to spend some time with my grunts.. Very imposing! 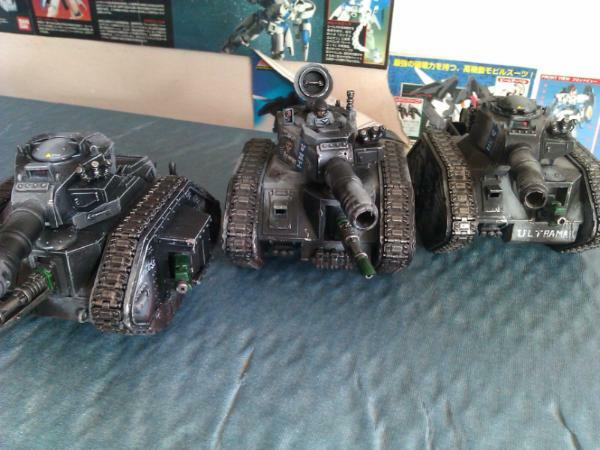 The dark paintjob is very subtle at first, although you wouldn't want to get to close to one of them to find out! Great stuff. I'm like the inverse Samaritans; I call you and list the reason why you'd be better off dead. 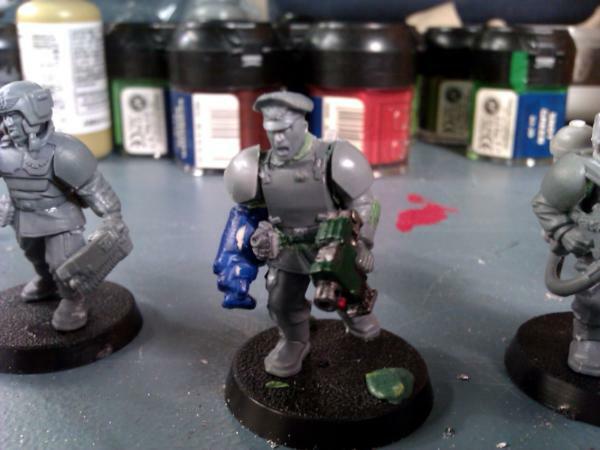 Thanks as always Cosmic, you're marines are looking awesome, I love the painting on the guardsman too even though the green and orange is too bright for my tastes! 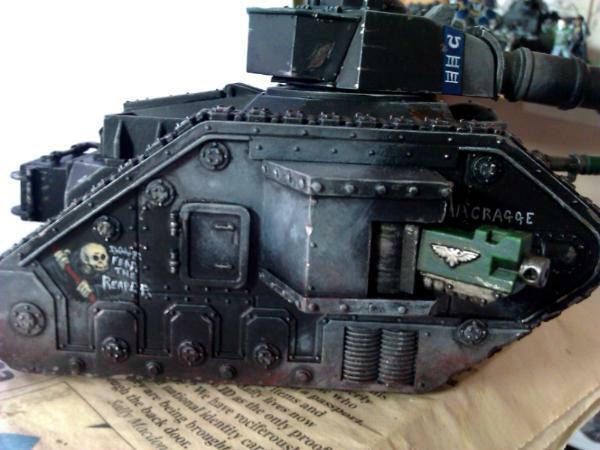 Thanks too Spoonpoodle, I'm honoured to have your 1st post! 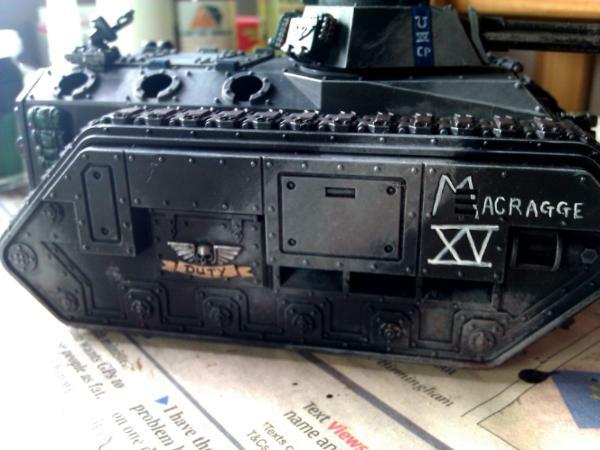 I decided to add a logo to the 'bumper' of the Dauntless, just because.. Here we see him basically held together prior to any real sculpting. His torso and arms have been spaced slightly to increase his stature. 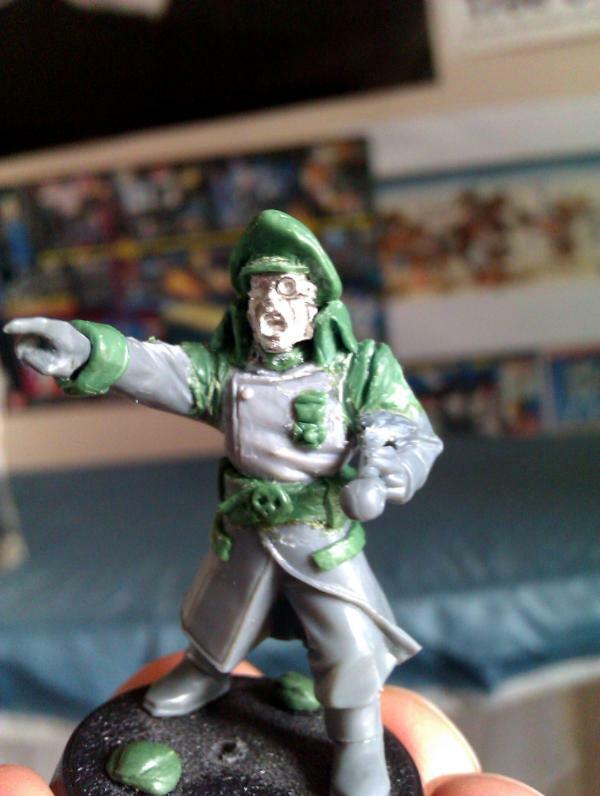 Most parts are basic guard items but the head is from the 'Masters of the Universe I mean Chapter' set. I've shaved off the shoulder pads and chest logo. Thanks, Randy. 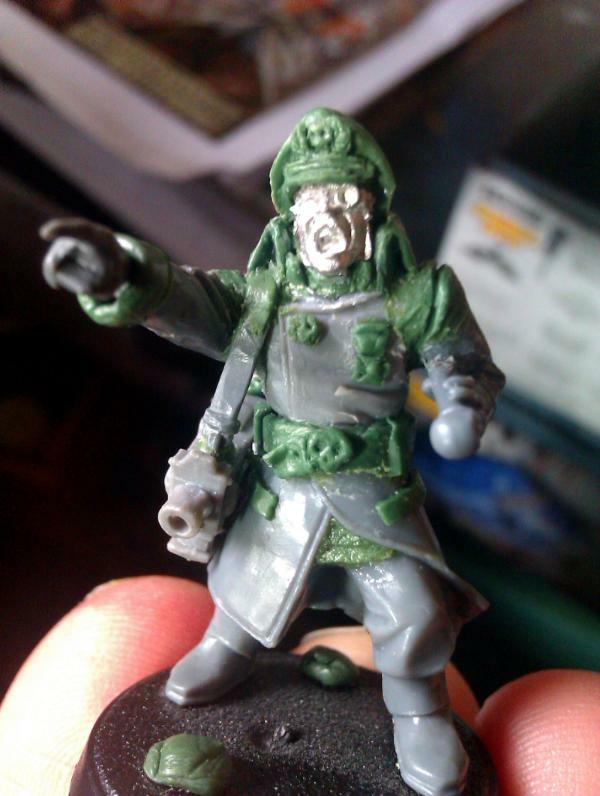 Yes, the guardsman is rather fluorescent! 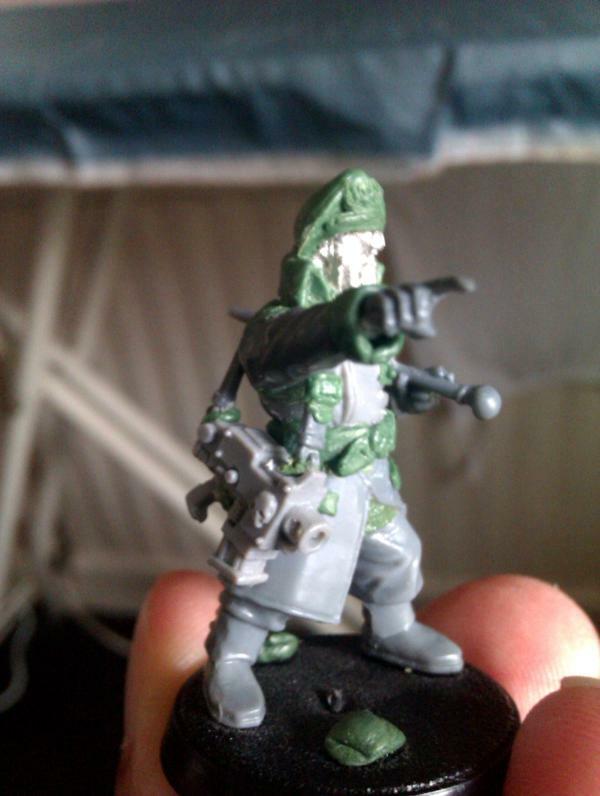 I'm very interested to see how your Commissar comes along. 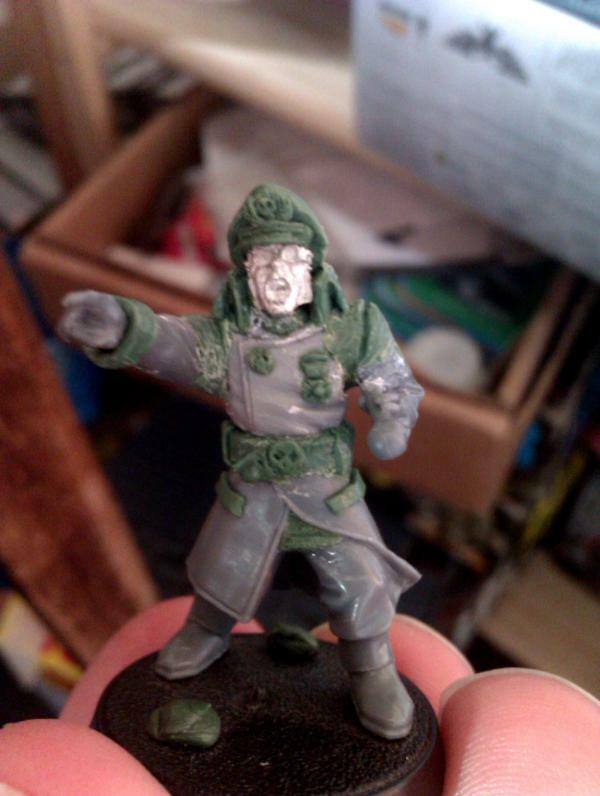 Almost a kind of Commissar Yarrick (spelling?) head. Have fun mate! Next stages of GS'ing, the belt over the torso is quite thick to hide the spacing, added a skull belt buckle to up the skull count. 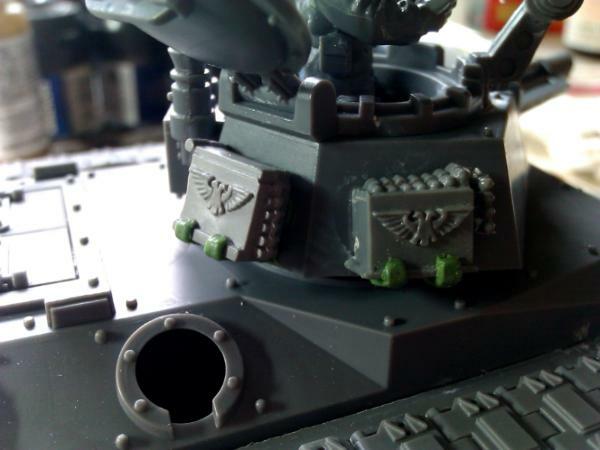 Covered up the removed chest aquila with a VC medal. 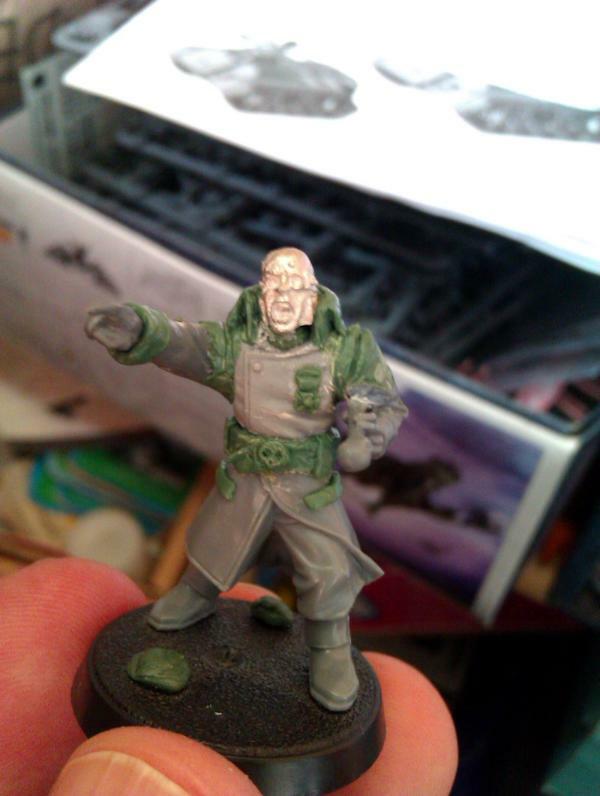 The strips under the belt are the pocket tops of his flasher's mac, as per the other commissar model. I added a sleave cuff to match the other arm. On to add the cap and a few other minor details...in 2 minds about the shoulder strap and BP what do you all think? Looking good! Going to keep him hatless? 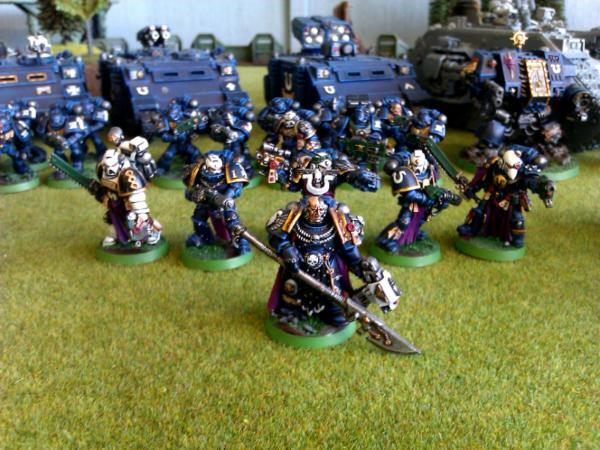 awsome army i love the theme, and i think its great to see pdf for the ultramarine homesystem its such a cool idea . That's an interesting idea, I hadn't planned anything like that and I generally don't use SC but I do like the idea. 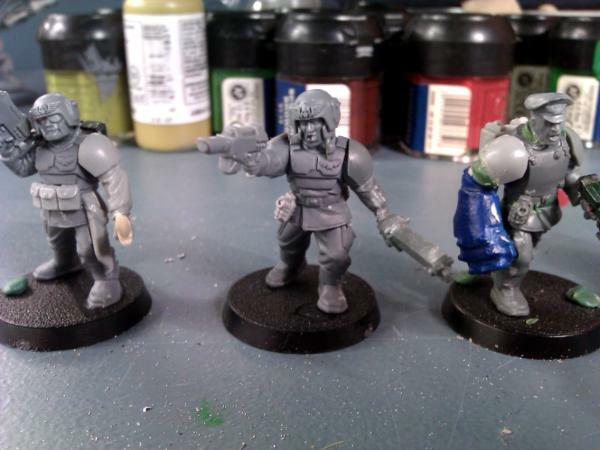 I have the Rogue Trader era Inquisitor in terminator armour who I am planning to add to this army as either a Commissar Lord in normal games or a Ordos Xenos guy in APOC but he would work as Strakan too! 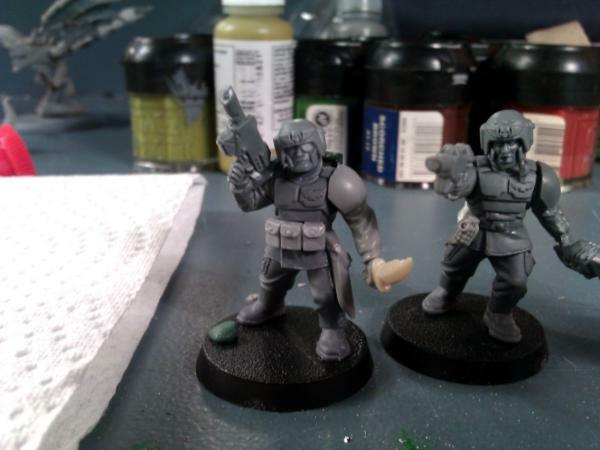 Otherwise I could use an existing marine HQ or Vet sarg maybe.. 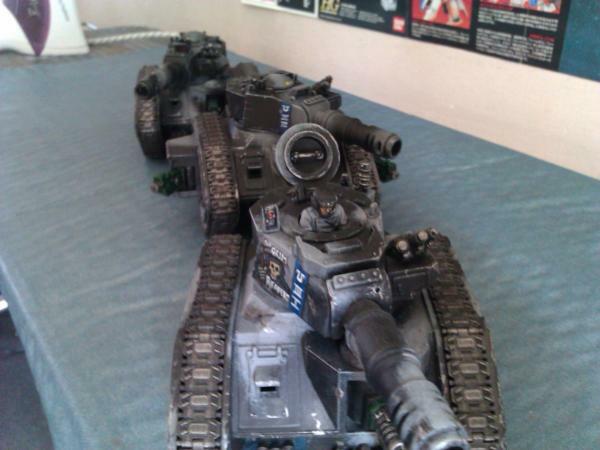 Very well done, nice to see some PDF forces amongst all the Mech armies out ther. 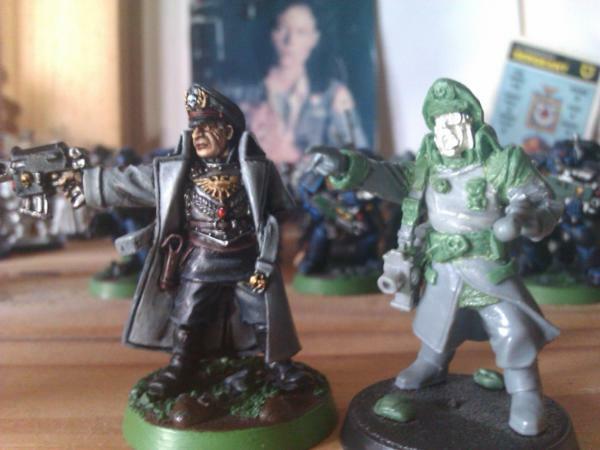 And yes, your commisar looks good. This is very nice. I think the blue/gray/white scheme works really well and actually think that putting blue on both shoulders would look strange. 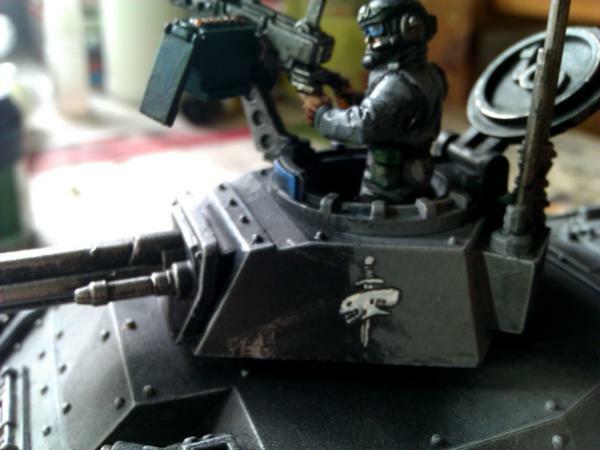 Its awesome what simple repositioning and small extra details does to making an army unique. The heavy wpns teams look great. 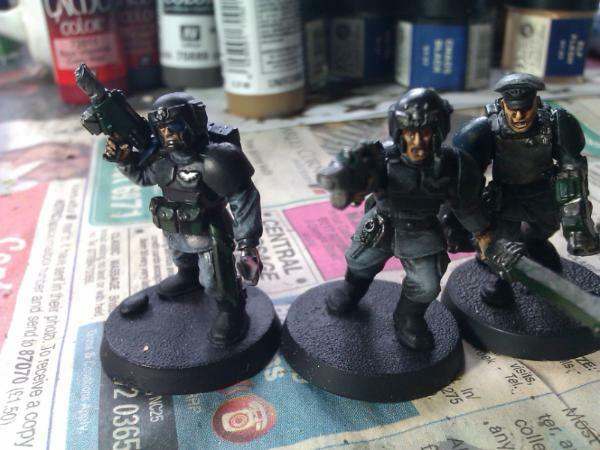 I also like the idea of using gold only on the officers. makes a big difference. 1 Tim. 4:12 - Don't let anyone put you down because you are young, but set an example for the believers in speech, in life, in love, in faith and in purity. 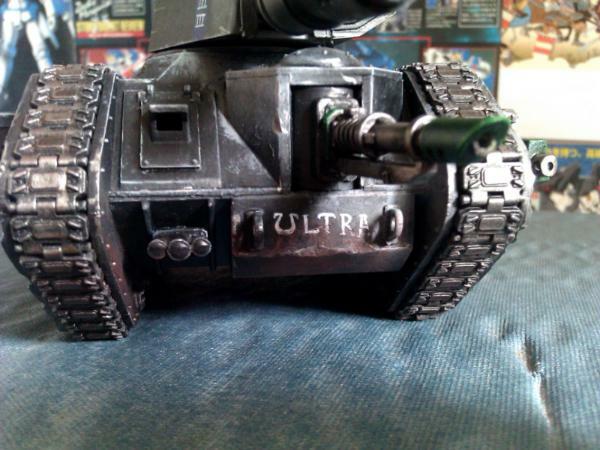 Um, isn't styrene + gasoline = napalm? Great work on this stuff, it looks really gritty. Especially the vehicles. 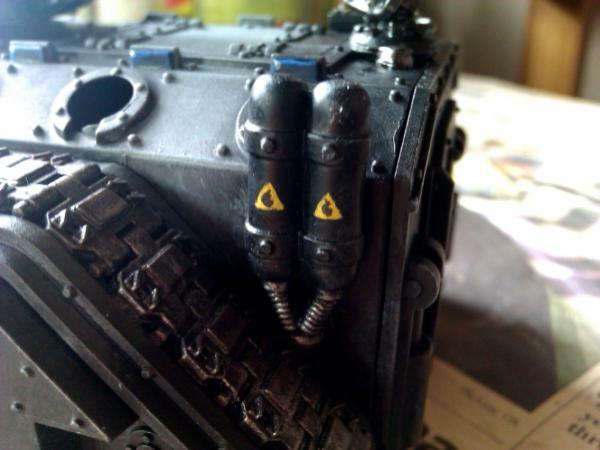 Trondheim wrote: Very well done, nice to see some PDF forces amongst all the Mech armies out ther. 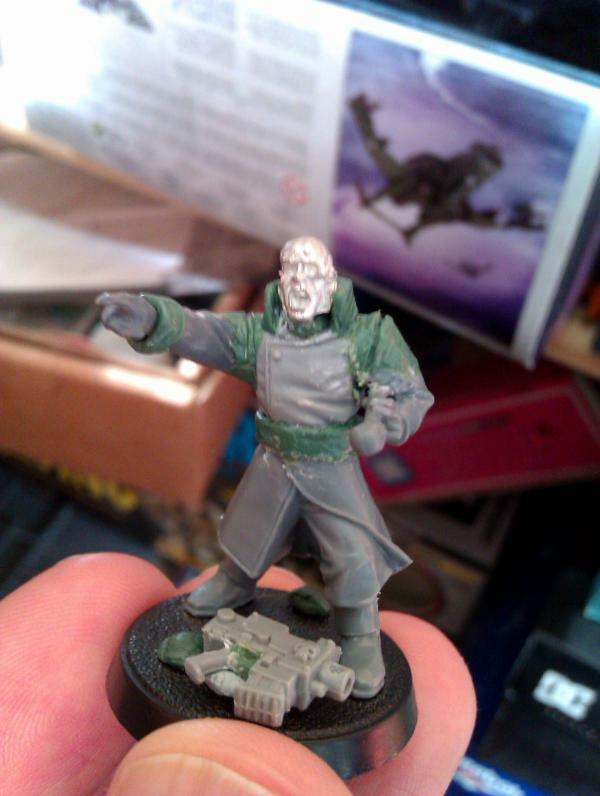 And yes, your commisar looks good. Thanks a lot guys, it's really inspiring to get comments. Excellent greenstuff skills, keep up the good work! First stage of strapping..Added tiny parts of shirt/cravat peeping out at collar too. 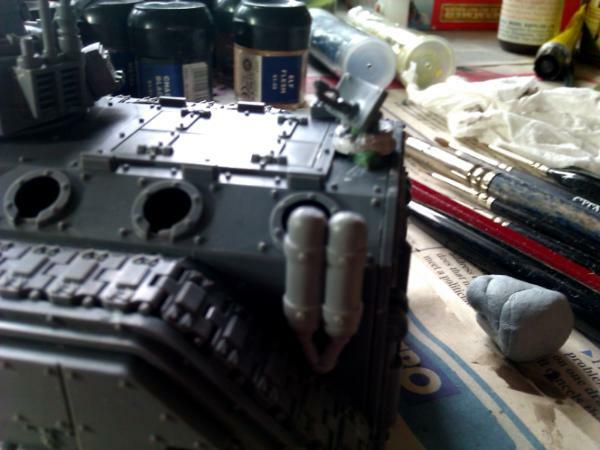 I used the straps off of the standard flamers as thry are plentiful and quite effective. Making straps from scratch out of GS can be a bit of a ballache..
Strapping complete!, I'll tidy up the contact points to the pistol once the GS has gone off. I added a buckle too. 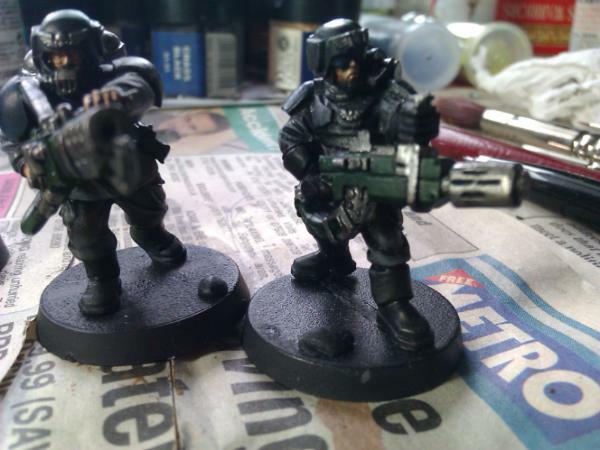 Here he is next to his colleague. 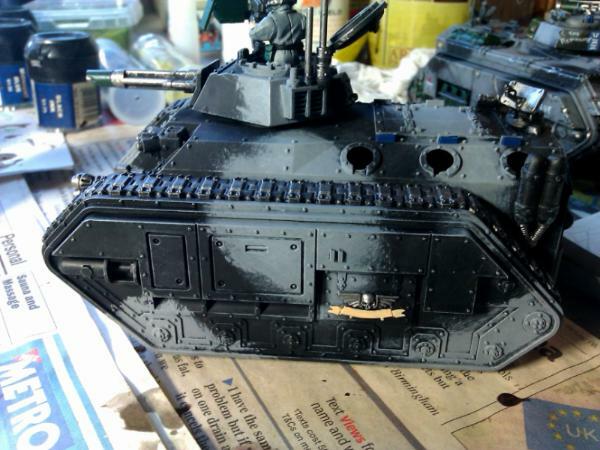 I need to do some minor trimming but otherwise he's pretty much built, now all I have to do is paint him................bah..
Wow... that is a sterling effort! Really cool. 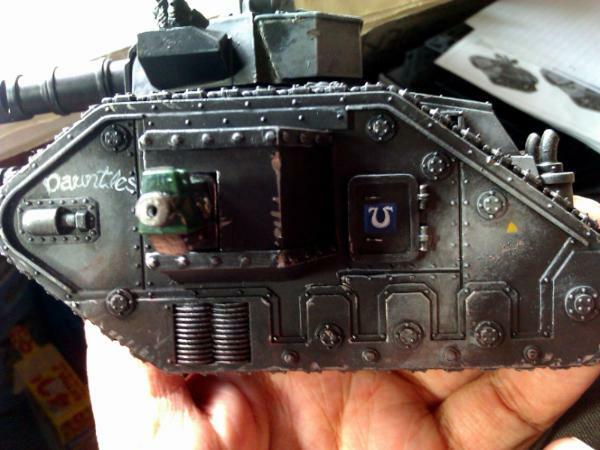 No doubt that the paintjob will be just as good.